STOP LAND EVICTIONS IN KYANGWALI! Land grabbing is no new thing in Uganda. For many years now, many people have been forcefully removed from their land. Some compensated and others left in the middle of nowhere with nothing. Families have been displaced and abandoned, children have dropped out of school leading to early marriages, people have committed suicide and others have been beaten and killed in the process. 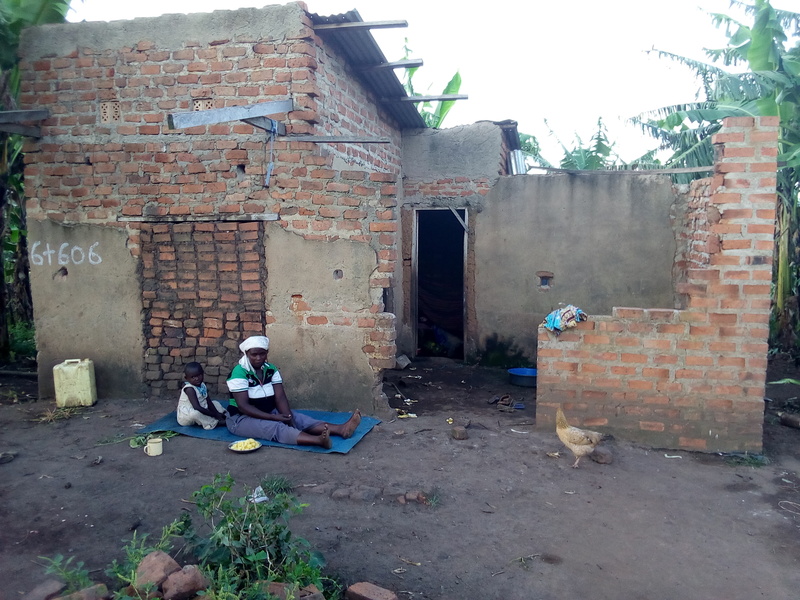 Last week we had a solidarity visit with the Kyangwali community and it was just another week of cries and lamentations from the local communities of Bukinda and Katikara, Kyangwali sub-county in Kikuube district western Uganda- a new district which was created in July this year. It was a tough week, from occupying the RDC’s office premises for four nights to Walking to Kampala to meet the president then being arrested and finally meeting the Speaker of parliament, Rebecca Kadaga. Bukinda and Katikala are comprised of 28 and 7 villages respectively. These villages are homes to the people being threatened eviction from the UPDF and the Office of the prime minister. They harbor people of different tribes who have lived peacefully for many years without any tribal differences but Bafaki is trying to instill hatred and conflict in them based on tribal lines. In 1966, Bunyoro kingdom leased out 50sq miles of land to the government of Uganda to set up the Kyangwali refugee settlement Camp for the Banyarwanda refugees. The area where the refugees were settled had settlements and gardens in the neighborhood belonging to the indigenous communities who were national. Both the nationals and refugees settled peacefully with the refugees buying food from the indigenous people until 1998 when the Prime minister came to fix boundaries of the settlement and the community. According to the demarcation done by Technology Consult of Makerere headed by one Nathan Batungi in 1998, the sizes of land where as follows, 91 sq. kms to the settlement, 36 sq km to the community of Bukinda and 7 sq kms to Katikara community. There was no conflict as per that demarcation between the community and the refugees and the government. This is one of the homes that were destroyed in the eviction process. In 2013 the Office of Prime Minister (OPM) started claiming ownership of the land that belongs to the nationals. This consequently led to the community being terrorized. The people of Bukinda were brutally and violently evicted from their land by police and the UPDF under the directive of Jean Kaliba the then RDC of Hoima district, Bafaki Charles the Principle settlement officer OPM, Solomon Osokon the then Region desk officer (RDO), Mugenyi David, the camp commandant Kyaka, the then DPC Hoima Kasangaki Augustine. The community members were given an ultimatum of three hours to vacate the land amidst beatings and shootings from over 300 police and army officials. People’s houses were demolished, gardens destroyed and at least 27 people lost their lives women and children inclusive. 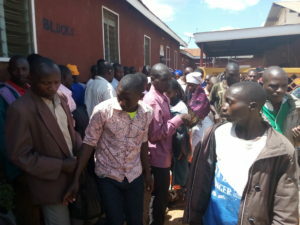 As a result, people fled to different areas including the neighboring Kagadi district. Communities were displaced, misery, disillusionment and frustration filled the communities. People who were not on this land by 1966 (regardless of whether your parents were on the land) were ordered to return to their indigenous communities for example a Mukiga to Kabale a Mukonzo to Kasese. The villages were surrounded by police and the army, people were ‘packed’ up in army lorries and ruthlessly ‘poured’ out like sand in different locations under the command of RDC Ambroze. Since then, these communities have not had peace even after the minister of Relief, Disaster preparedness and Refugees, Hilary Onek ordered the refugees to be evacuated from the Nationals land following a directive from OPM. Ironically the OPM was providing shelter to refugees who had fled their countries because of the insecurity therein yet they were terrorizing the indigenous owners of the land. The people they were supposed to be protecting. 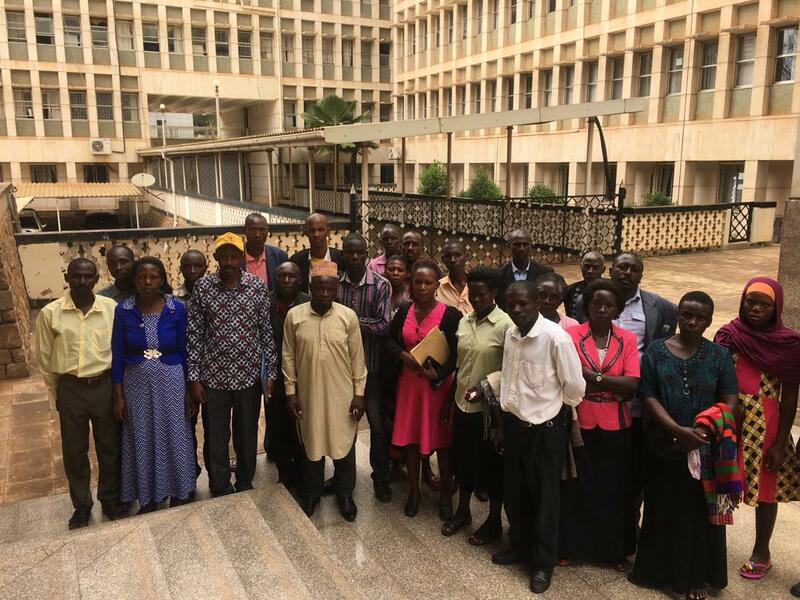 On Friday 16th November 2018, the people of Kyangwali occupied the premises of the Resident District Commisioner (RDC) of Hoima demanding that the promise of restoring their land that was earlier made by the president be fulfilled. The RDC instead ordered them to vacate his premises on Monday 19th November 2018 after they had been there for four nights or else they would face the wrath of the powerful! With nowhere to go since they were chased off their land and their homes broken, they decided to walk to the President who promised them protection and restoration of their land. 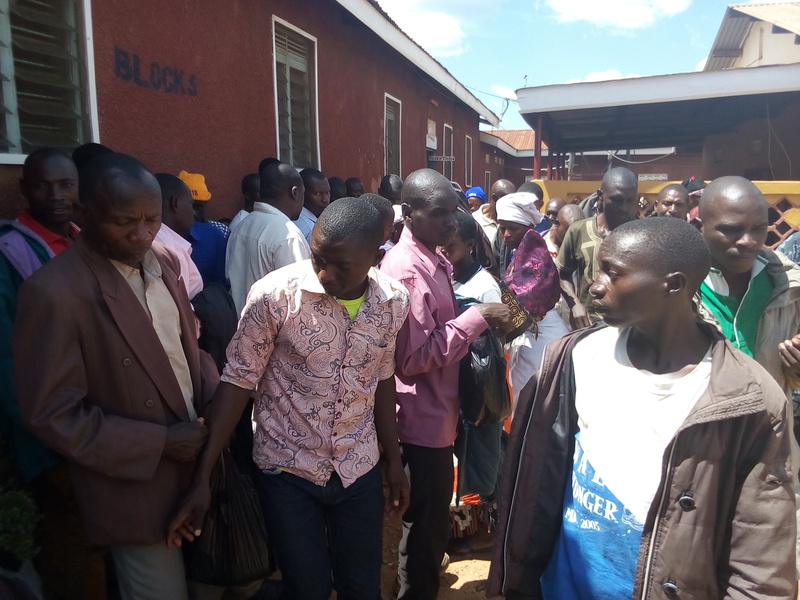 Behold they could not go beyond Kiboga district as the police intercepted them and blocked them from continuing their journey. Some of them were grabbed by police and put inside cells for some hours. They were later released and allowed to go back TO Kyangwali. With no transport funds, they started walking back the 86.9km. 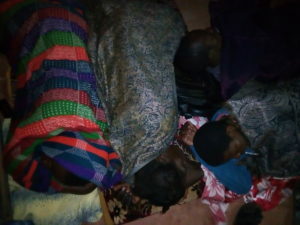 They grew wearily as they approached Hoima so they spent a night at Safari Land lodge sleeping on the veranda and compound. On Thursday 22nd November 2018. 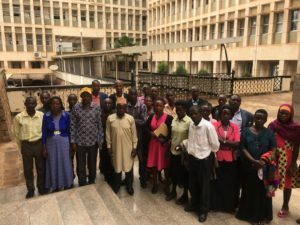 Tired and frustrated, the community members decide to send a few of their colleagues to present their petition to the speaker of Parliament Rebecca Kadaga in regard to the Kyangwali land evictions. The Speaker ordered the land evictions to stop immediately and set up a committee to investigate the matter and present a report in seven days. As the Kyangwali people countdown the seven days for the report, they returned to their people, though the speakers’ decision was not final, it gave them hope. Hope that they will finally settle peacefully, hope that they will be recognized as nationals as they had always been before all this land eviction madness began. Hope that their children will be able to go back to school and their families will be reconciled. The #Bafaki tales never cease! 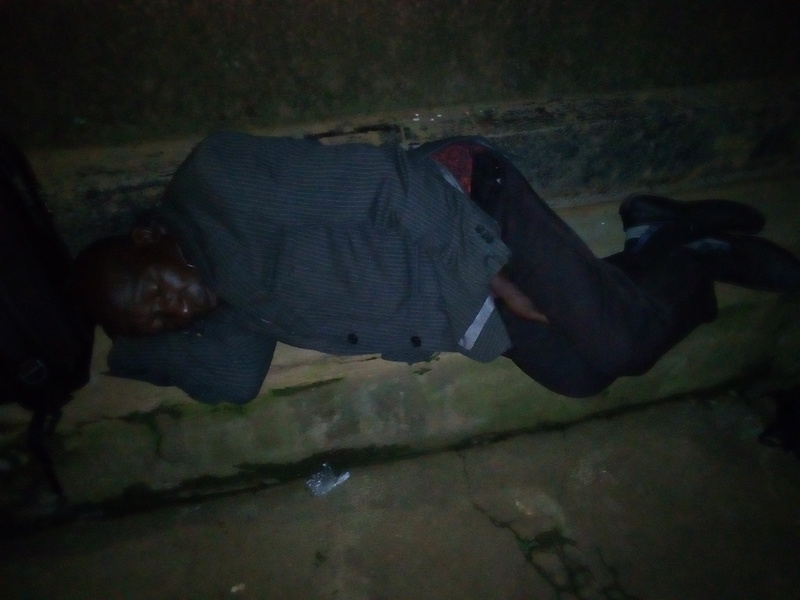 Just when the people of kyangwali are starting to settle in and have some peaceful nights he appears in their land again. Yesterday, 27th November 2018, he appeared with several police and army officers in Bukinda- Kyangwali sub county. He assured the residents that they will not succeed in the pursuit of their land. This has happened after the speaker of Parliament, Rt. Hon Rebecca Kadaga ordered the Kyangwali Land evictions to stop after the community members presented their petition to her. Now this is not the first time #Bafaki tries to grab land from communities. 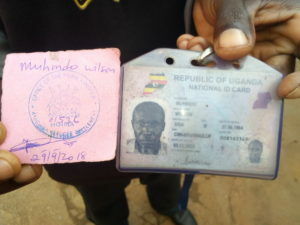 Early this year (2018) he was arrested by the Commission of land inquiry after he was accused of using his position as Principle settlement officer in the office of the prime minister to extend boundaries of a refugee camp into land that belonged to Tooro Prime Minister Stephen Irumba. In addition he again appeared before the commission for the #Kyangwalilandevictions which he was ordered to stop immediately but unfortunately he went ahead to defy these orders.Looks like #Bafaki learnt nothing from that experience because he is doing a similar thing in Kyangwali. We shall only rest when these citizens are fully settled and happy in their homes without police or solidiers loitering in their neighbourhood. When they are no longer Living in fear of what may happen the next second. Fear of being tortured and killed in cruel ways by the people they hoped would protect them.